How it’s New York: It’s just north of Times Square, named for a guy who was born in Times Square, honoring a guy from The Bronx and organized by a New York-based organization. And it will feature that treasured New York institution–an open bar. How it’s Irish: It ain’t–it’s Irish American! The award is named for a towering Irish American literary figure, given to a supremely talented Irish American writer by an organization that has “Irish American” in its name. And it will be crawling with the likes on Malachy McCourt, Peter Quinn, TJ English, Michael O’Keefe, Mary Pat Kelly, Ashley Davis and William Kennedy–meaning there will be two Pulitzer Prize winners in the house! Academy-Award winner Olympia Dukakis and Emmy-Award winner Debra Messing will join renowned theatre and film director and Tony-Award-winner Doug Hughes to toast the career of playwright, screenwriter, and film director, John Patrick Shanley, at the Irish American Writers and Artists (IAW&A) annual Eugene O’Neill Lifetime Achievement Award celebration on Monday, Oct. 21, 2013 at the Manhattan Club, upstairs at Rosie O’Grady’s, 800 7th Avenue (at 52nd Street), New York City, starting at 6 p.m.
John Patrick Shanley, winner of the artistic “trifecta” of a Pulitzer Prize, an Oscar and a Tony Award will add the Eugene O’Neill Lifetime Achievement Award to his list of honors at the Irish American Writers & Artists annual celebration. He has written over 20 plays including Danny and the Deep Blue Sea and Savage in Limbo. 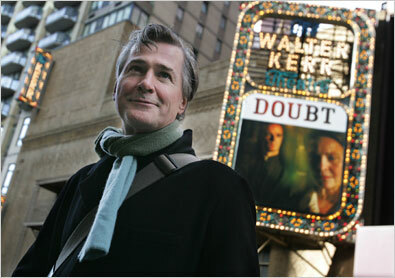 For his play, Doubt, he received both a Tony and the Pulitzer Prize. As a screenwriter he received an Academy Award for best original screenplay for Moonstruck. The film version of Doubt, in which he directed Meryl Streep, Philip Seymour Hoffman and Amy Adams, was nominated for five Academy Awards, including Best Adapted Screenplay. Doug Hughes has had an acclaimed career as a Broadway director and won the 2005 Tony Award for his direction of Doubt. He will be directing Shanley’s new play, Outside Mullingar, on Broadway in January 2014. Olympia Dukakis, a vital, respected actor of the classic and contemporary stage won an Oscar for her portrayal of Cher’s sardonic mother in the romantic comedy Moonstruck (1987). Her “roasting” of Shanley at the O’Neill Award is highly anticipated. Debra Messing is widely known for her television roles in Will & Grace, The Starter Wife, and Smash. She will star in the Broadway production of Outside Mullingar, and will read from a selection of Shanley’s works during the O’Neill Award festivities. IAW&A Boardmember and comedian Sarah Fearon will act as Master of Ceremonies and Celtic songstress Ashley Davis will conclude the program with a song. The Eugene O’Neill Lifetime Achievement Award was established in 2009 to honor the accomplishments of a writer, actor, musician, or cultural institution that has sustained a body of work that best exemplifies the level of integrity maintained by O’Neill. Past honorees include Pulitzer-prize winning author William Kennedy, actor Brian Dennehy, Charlotte Moore and Ciarán O’Reilly of New York’s Irish Repertory Theatre, and folksinger Judy Collins. The award, created by Tiffany & Co., will be presented Mon., Oct. 21, 2013 at a generous hors d’œuvre and open bar reception and ceremony at the Manhattan Club above Rosie O’Grady’s in Times Square, just a few blocks from where Eugene O’Neill was born. Ticketing information is available at the IAW&A website. For more information on the IAW&A, visit the organization’s website at http://i-am-wa.org/ or its Facebook page for updates and information.